Fox News Channel’s “Hannity,” conservative talker and legal expert Mark Levin discussed the plea deal Michael Cohen made with the prosecutor for the Southern District of New York. Levin argued Cohen pled guilty to the charges that weren’t even offenses simply because the prosecutor insisted they were offenses. “HANNITY: All right, Mark, I mean, there are some lessons here. I agree that you shouldn’t lie to the FBI. Everyone agrees with that. I also agree that you should pay your taxes. I also agree that you better not lie on a bank loan application. Mark, how did we get from Russia and that this is it after nearly, we are almost at 500 days. The general counsel for the Clinton mob family, Lanny Davis, he had his client pleaded two counts of criminality that don’t exist. These campaign finance violations that is all over TV, they are saying implicates the president of the United States directly. More, let’s say that this candidate settles a lawsuit that was initiated before he becomes a candidate. And he says to his personal lawyer, I want you to pay, settle that lawsuit. You can use my corporate funds, my private funds, whatever it is. That is perfectly legal, too. The prosecutor would say, but that influenced the election. So what? There are certain things you do that influence an election that are legal and certain things you do to influence an election that is illegal. What’s next? The Manhattan madam. He’s got — he’s got Manafort where he wants him on banking charges, he set up a few guys like Flynn who has gotten in trouble. Now they have Cohen. What do they have? They have nothing. I’ll tell you what they have. Lanny took to Twitter today to solicit fund for Cohen to be able to “tell the truth”. This is still a witch hunt. The left will stop at nothing to impeach Trump. Obama and Hillary broke campaign finance laws. This is something that happens all the time. 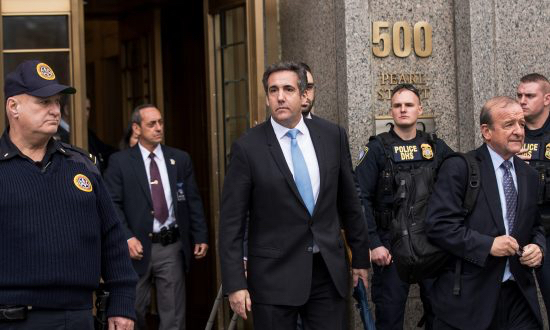 The left is so unhinged that they promised Cohen a deal if he would say anything against Trump. Sadly, he took the bait and lied. He should have remained silent and honest and things would have turned out different for him. They own him now. “Thank you for inviting me to speak with you today. First, I want to comment briefly but clearly on the presumed subject of this morning's interview. Second, I want to address what I believe are the implications of it. Let me be totally clear that I am innocent of the allegations raised against me in the public square, which are based upon misinformation and unnamed or unverifiable sources. I have never engaged with, been paid by, paid for, or conversed with any member of the Russian Federation or anyone else to hack anyone or any organization. I have never engaged with, been paid by, paid for, or conversed with any member of the Russian Federation or anyone else to hack or interfere with the election. I have never engaged with, been paid by, paid for, or conversed with any member of the Russian Federation or anyone else to hack Democratic Party computers; and I have never engaged with, been paid by, paid for, or conversed with any member of the Russian Federation or anyone else to create fake news stories to assist the Trump campaign or to damage the Clinton campaign. Given my own proximity to the President of the United States as a candidate, let me also say that I never saw anything - not a hint of anything - that demonstrated his involvement in Russian interference in our election or any form of Russian collusion. I emphatically state that I had nothing to do with any Russian involvement in our electoral process. In fact, I find the activities attributed to the Russian Federation, if found to be true, to be an offense to our democracy. As an attorney, I believe justice ought not to be politicized in the United States of America - neither in this Senate office nor in the courts. I'm certain that the evidence at the conclusion of this investigation will reinforce the fact that there was no collusion between Russia, President Trump or me. I'm also certain that there are some in this country who do not care about the facts, but simply want to politicize this issue, choosing to presume guilt - rather than presuming innocence - so as to discredit our lawfully elected President in the public eye and shame his supporters in the public square … this is un-American. My reputation was damaged in December 2016 when BuzzFeed published an unverified dossier prepared by a retired British spy - Christopher Steele - that was riddled with total falsehoods and intentionally salacious accusations. In my opinion, the hired spy didn't find anything factual, so he threw together a shoddily written and totally fabricated report filled with lies and rumors. The New York Post recently noted that much of the information in the dossier appeared at points to be copied from the internet; with typographical errors included. My name is mentioned more than a dozen times in the lie-filled-dossier and so within moments of BuzzFeed's publication, false allegations about me were plastered all over the national and international press. The accusations are entirely and totally false. I have never in my life been to Prague or anywhere in the Czech Republic. I might also add that I only have one passport (a United States Passport). I have to say that to you today - that I only have one passport - because another media outlet suggested that - as a Jew - I must also have an Israeli passport! My wife and I have been married for 23 years and are now entering into the season of our lives when we get to watch our children become adults themselves. My daughter, who is at an Ivy League school, and my wife, who is of Ukrainian descent, have especially been subjected to harassment, insults, and threats … some so severe I cannot share them in mixed company. You might say that the experiences I am living through are the cost of being in the public eye, but they shouldn't be as I am not a government official. Many Trump supporting Americans are also paying this cost, like the twelve-year-old child in Missouri who was beaten up for wearing a Make America Great Again hat. You can oppose the President's points of view and his policies, but not raise false issues about the validity of his victory. I assume we will discuss the rejected proposal to build a Trump property in Moscow that was terminated in January of 2016; which occurred before the Iowa caucus and months before the very first primary. This was solely a real estate deal and nothing more. I was doing my job. I would ask that the two-page statement about the Moscow proposal that I sent to the Committee in August be incorporated into and attached to this transcript. I'm very proud to have served Donald J. Trump for all these years, and I'll continue to support him. If we really are concerned about a Russian attempt to divide our country and discredit our political system then the best thing we can do is put aside our infighting, stop presuming guilt rather than the innocence of American citizens, and address this national security threat as a united people at its source. If the statements made to the House Intel Committee in 2107 are true, it means Cohen lied in his guilty plea. If they are false, he lied to the Committee. Either way, he is a liar and not to be believed! Either way he is a WEASEL! The idiot Cohen pleads guilty to a non-crime all in an effort to take down our President. Cohen is a jackass. I think they are trying to entrap the President. He needs to stay as far away from this situation as possible, and say nothing. Loved this article, very informative.